He made his debut on MyFonts with Letrista Script, which was influenced by the art of sign painting. The typeface was featured in the April, 2013 edition of Rising Stars, and has been one of the foundry’s best selling fonts. It was also chosen to be part of the fifth biennial of Latin-American typography Tipos Latinos 2015. Since then, Felipe has continued to find success drawing inspiration from this style that he knows and loves. One of his most recent designs, Hollie Script, pays tribute to brush lettering styles from the 1950’s and 1960’s. The script has been honored by the Type Directors Club New York 2015 with the Certificate of Typographic Excellence. 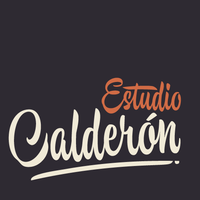 Estudio Calderón is a quiet office where inspiration comes daily. With both a graphic design and lettering department in the studio, the designers work together to articulate the fonts, lettering and graphics that they produce.